Warning! Please note that this blog is over 1 year old, please review the latest on InfluxDB and read the InfluxDB documentation. With the 0.9.4 release of InfluxDB comes new statistics and diagnostics support. This information allows developers and system administrators to make better use of their InfluxDB system, diagnose problems, and troubleshoot issues. 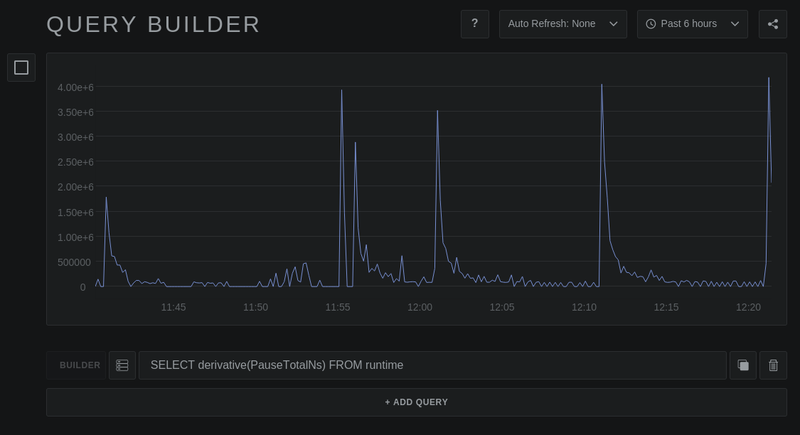 This post outlines some of statistics and diagnostics currently gathered by InfluxDB, and some advice on how to work with this information. Please note that this functionality is still experimental and is subject to change. Let’s take a look at the runtime statistics, which capture details about the Go runtime. In this case SHOW STATS gives you an overview of memory usage by the InfluxDB system, within the Go runtime. Many Go developers will recognise the importance of these numbers. This output shows the number of queries received (query_req), by this node, since the system started – 2 in this example – and the number of bytes returned to the client, 418 in this case (this system just started!). Most inputs, such as Graphite and openTSDB, also have detailed statistics available. This can be particularly useful when working with these systems. We get plenty of questions about performance of these inputs, so this statistical information can be really useful. This shows the number of points received by the Graphite service on port 2003 (points_rx), for the TCP protocol. It also shows the number of points sent to the database (points_tx). If you notice points_rxis greater than points_tx. This shows that the Graphite input is buffering points internally, as it batches writes into the database for maximum throughput. These are just a few quick examples of what SHOW STATS can do. Keep in mind that depending on what services are enabled, and what code paths execute within the database, you may see statistics from other components. All this statistical information is very useful, but is reset when the system restarts. What if we want to analyze the performance of our system over time? Of course, InfluxDB is a time-series database, built especially for storing this kind of data. So the system periodically writes all statistical data to a special database called _internal, which allows you to use the full power of InfluxQL to analyze the system itself. If you have questions about how InfluxDB is using the Go heap, it’s easy to see how usage changes over time. For example using the influx CLI, issue the following queries to see Go heap usage every 10 seconds. Even better, when coupled with a tool like Chronograf, you can visualize all this data. The next example of a query, also visualized using Chronograf, shows a derivative query of the total garbage collection (GC) pause time of the Go runtime. Since this graph shows rate-of-change, the spikes in the graph show when a GC pause took place. The final example shows Graphite statistical data. The first graph is also a derivative, this time of the number of bytes received by the Graphite input. 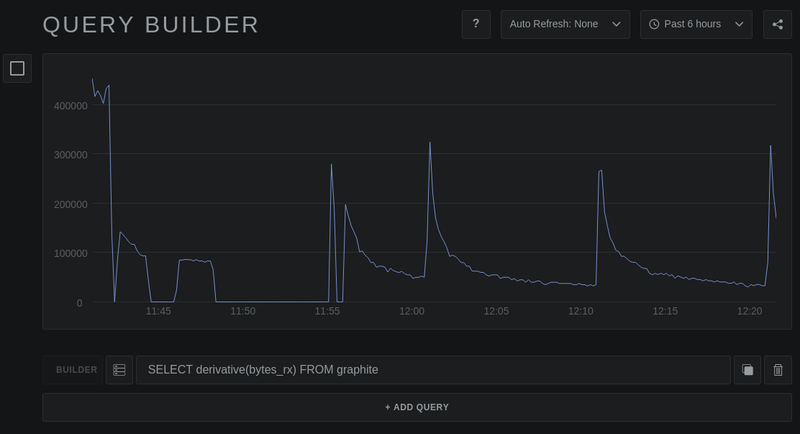 As can be clearly seen, the Graphite data is sent to InfluxDB in a very bursty manner. 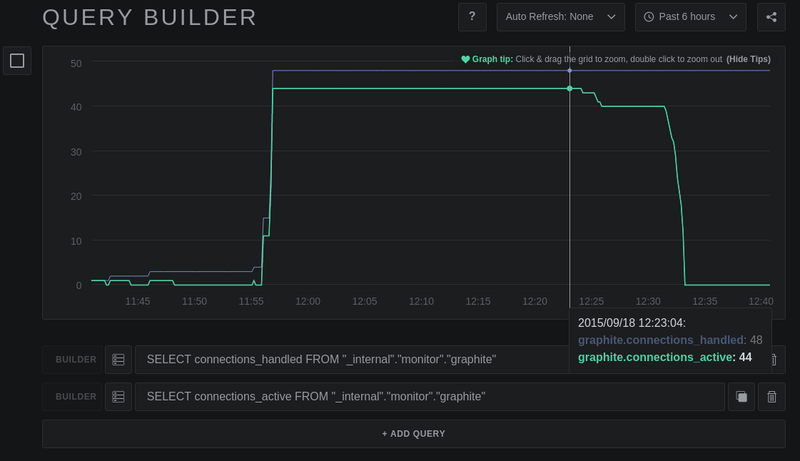 This last graph shows Graphite traffic lasted about 30 minutes, during which time theconnections_active count was non-zero. Because every node in your cluster writes these statistics to the _internal database, queries against_internal return data for the whole cluster, which can be very useful. However, all data is tagged with the hostname and node ID, so analysis of a specific node is always possible. Shown below is points_rxfor the Graphite service on just the node with hostname malthus. But remember, the commands SHOW STATS and SHOW DIAGNOSTICS only ever return data for the node on which the query executes. All statistics data are available in standard expvar format, if you wish to use external tools to monitor InfluxDB. This information is available at the endpoint /debug/vars. Diagnostic information is treated a little differently within the InfluxDB system. It’s mostly information about the system that is not necessarily numerical in format. It is important to note that diagnostic information is not stored in the _internal database. 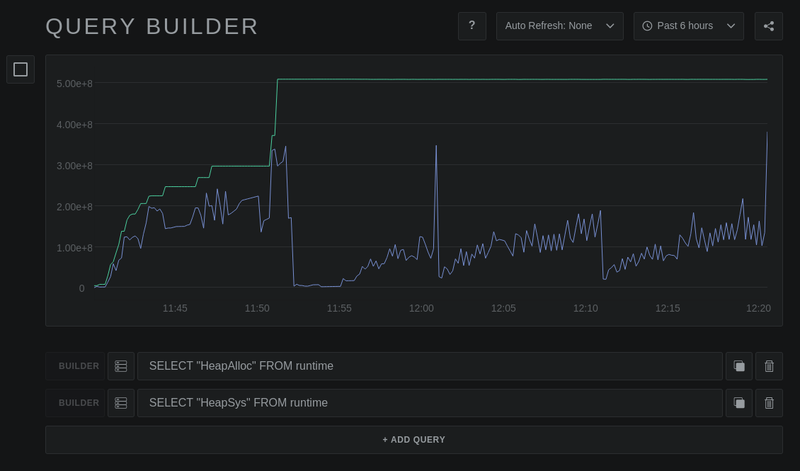 Example data is the build version of your InfluxDB and its uptime. 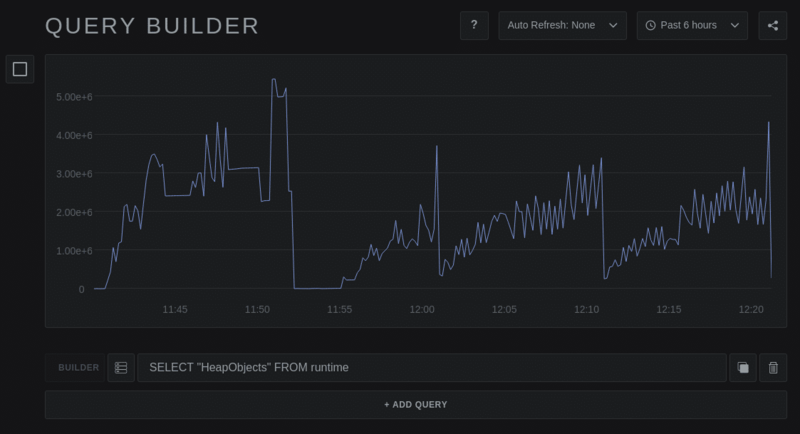 This information is particularly useful to InfluxDB Support, so be sure to include the output of this query anytime you file a Support ticket or Github issue. Example output is shown below. As development proceeds, we’ll be adding more and more statistical and diagnostic information, and we encourage open-source developers to add statistics and diagnostics to any code they contribute, if it makes sense. We hope you find this information useful, as you work with InfluxDB.